Project Report, the journalism contest organised by YouTube and the Pulitzer Center to reward non-professional journalists producing videos, is drawing to a close. Until January 9, viewers can vote on videos produced by the five finalists, who have progressed through two previous rounds of the competition, producing a different short film each time. Entries include videos about Gay/Lesbian/Bisexual/Transgender (GLBT) groups in the US, sexual abuse by priests and a community of developmentally disabled adults. Videos can be watched and voted for on the YouTube Project:Report channel and the winner, who will receive a $10,000 grant to report on any topic, from anywhere in the world, and a scholarship at the Pulitzer Center, will be declared on 11 January. This entry was posted in Citizen journalism, Events, Training and tagged D.C., non-professional Journalism, Project Report, Pulitzer Center, United States, USD, Video, Washington, YouTube, YouTube Inc, YouTube Project:Report channel on December 23, 2008 by Alexander de Vivie. A look at where the news has unfolded. Please post additional links below. Journalism.co.uk will add in more links as they are spotted. Washington-based blogger and social media expert, Gaurav Mishra talks to Journalism.co.uk in an interview published on the main page. NDTV looks at the way it unfolded on the net and promotes its own forums. “Citizens of the World Wide Web have connected to terror-stricken Mumbai in a way never seen before,” it reports. One eyewitness, Dinesh Kumar, used a forum on NDTV.com to share his experiences as he tried to make his way back home from work, the article says. The Wikipedia current event page is almost filling role of a blog or news service, with its extremely quick updates. Flickr users such as Vinu, have uploaded pictures from the scene (images: all rights reserved). 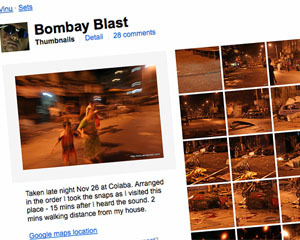 A Flickr search such as this one, brings up images from Mumbai, although many are reproduced from a few sources. People have also taken pictures of the television news coverage. But before you re-publish your finds beware: an advanced search which filters pictures by copyright and only shows up images opened up under Creative Commons, limits the results. Bloggers, such as Gaurav Mishra are tracking it live, and point out useful links. He has also collected together relevant Tweets. Other blogs to look out for: Rediff.com; Mumbai.metblogs.com. More to come. List of blogs, probably from outside, but outside Mumbai: Blogada roundup here. The BBC has a good stream of breaking news, with most recent at top; likewise, the Guardian’s is here. Away from mainstream media, NowPublic are charting it here and Ground Report here. Facebook doesn’t seem to have that much activity as yet and is not that helpful for finding news, although members of Mumbai related groups are posting comments on the walls. Update (27/11/08): New Facebook groups formed:‘In memory of all those who died in the 26th-27th november MUMBAI massacre’; ’26 November 2008 – Terrorist Attacks on Mumbai’. This Roomatic page brings together Twitter updates in chatroom format: makes it very easy to follow and updates quicked than you can read. Summed up here, at Wired.com. NYTimes.com has linked photos to the attack sites on its interactive map. The Guardian does a nice job here. Click on the cameras to see what took place. The Google video seach is here. YouTube videos are mainly limited to broadcast footage, with one user even filming the TV reports, for those without access to live television coverage. YouTube videos seem to be all second-hand broadcasts from mainstream media. Mirror.co.uk (Mumbai November 26-7) and Guardian (for past terrorist attacks in India). BBC timeline here (complete with contentious Twitter quote). This entry was posted in Citizen journalism, Editors' pick, Multimedia, Online Journalism and tagged Amit Varma, Amy Gahran, Arun Shanbhag, attacks, BBC, bombay, British Broadcasting Corporation, Citizens of the World Wide Web, creative commons, D.C., date, Dinesh Kumar, Facebook, Flickr stream, Gaurav Mirshra, Gaurav Mishra, google, India, Journalism.co.uk, Lloyd Shepherd, Maharashtra, mainstream media, media, media expert, Mirror.co.uk, Mumbai, NowPublic, social media, social media expert, Sonia Faleiro, The Guardian, Twitter, Twitter stream, United States, Washington, YouTube on November 27, 2008 by Judith Townend.